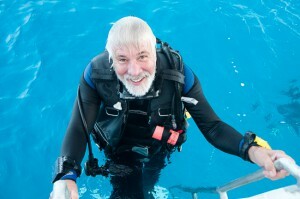 Jerry Beaty travels in support of dive tourism so frequently that he often must have extra pages added to his passport. 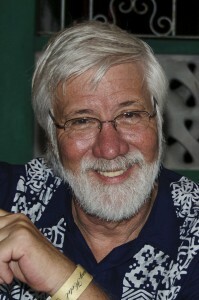 In fact, when it comes to dive tourism, Jerry’s knowledge, contacts and insights are unmatched. Back in the 1980s, Jerry was a manufacturer’s rep for several major dive equipment lines. At the same time, he and his late wife Shawn began repping Bayman Bay Club in Honduras. This effort eventually expanded into a full dive travel wholesale company.For the past seventeen years, as Dive Training‘s Associate Publisher, Jerry has consulted with governments, hotels, tourism offices and dive operators on how to increase dive tourism. Jerry says, “The benefits of a successful tourism program go beyond specific hotels and dive operators; a successful tourism program benefits the people who live in that country." The above bio was written by someone else. All though I won’t dispute it and it is all true, it sounds more like what I would put on my resume… if I had one. The view from my side is that I fell into a series of jobs that allowed for a life that could feed my personal addiction to travel, adventure and making a stream of friends in countries all over the world. To top it off it was always about scuba diving, always related to some part of the dive industry. I’ve represented equipment manufacturers, booked and sold dive travel and helped other people sell dive travel. I have had the privilege of working with dive retailers all around North America. My present job in dive publishing allows me to work with dive operators around the world and tourism boards in most of the Caribbean basin and a few in lands far, far away! I have been blessed and keep my fingers crossed that it continues for quite a while longer!